The film Non-Bifurcated Diary conveys the struggle, fear and confusion of being unable to unite art-practice, work, and personal relationships. Working from the artist’s personal journal, it juxtaposes a real, everyday concern with a trance-like state of mind. This is illustrated by the dancer moving but not progressing; she appears immobilized. Non-Bifurcated Diary pushes the territory of dance and film. Using four cameras simultaneously, the camera lens takes control of the dancer, turns her like a marionette, and lets her repeat the exact same movement viewed from a different angle. 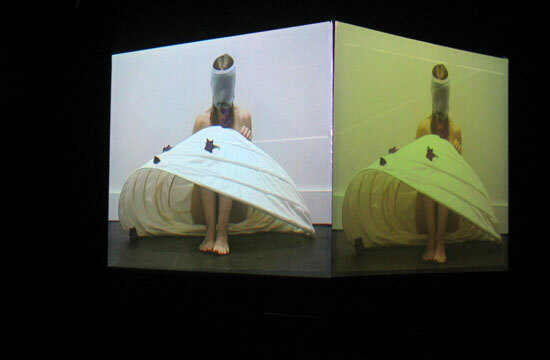 The work constitutes a solo-dance performed by the artist herself. Originating from her cross-disciplinary background she has chosen to use a skirt or non-bifurcated garment, a symbol for opposing Western ideas of femininity and masculinity, as the tool for her dance.